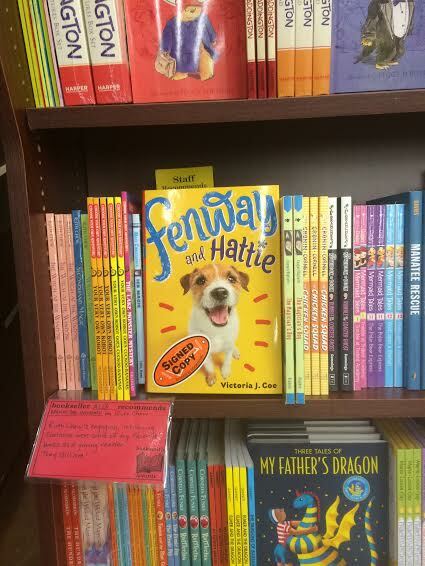 On Launch Day, I had a ball taking a copy of Fenway and Hattie to Fenway Park! I started making the rounds - visiting local book stores, meeting fabulous booksellers, and autographing books! And there are so many more book stores I hope to visit soon. The Boston area is loaded with amazing booksellers! On February 24th, I was honored to participate in World Read Aloud Day by reading to two classes of 4th and 5th graders at Cyrus E. Dallin Elementary School. I'm so happy that superstar librarian Rebecca Aaronson agreed to host me! I'm a big fan of serendipity! In early March, I was in New York City when on the spur of the moment I reached out to reading specialist extraordinaire Susie Rolander (pictured below) and luckily, she was available for a fun chat. I had a blast "talking shop" with and learning from this fabulous lady! And no trip to New York is complete without a visit to the paradise for young readers, Books of Wonder! Lucky for me, picture book luminaries Sophie Blackall and Brian Floca were reading at BOW that day. 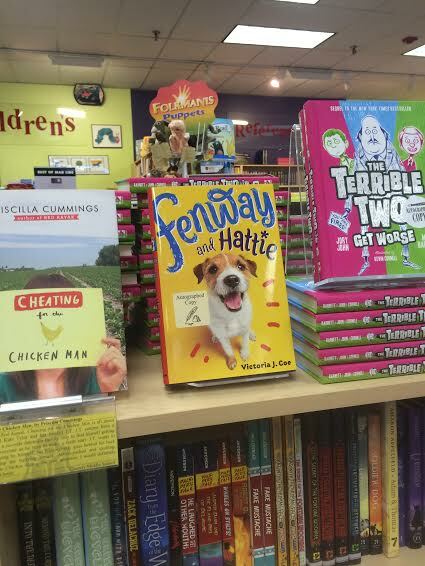 Listening to Sophie read was incredible, and even more incredible was signing Fenway and Hattie alongside Brian! I was deeply honored to meet these two Caldecott winners, but honestly, the one who stole my heart that day was a dog named Deke. On the shelf, with Sophie Blackall, signing beside Brian Floca, getting a kiss from DEKE! And while all of that was a lot of fun, best of all was taking time to celebrate the book launch with my family and friends. First was a party at Henry Bear's Park where Boston radio goddess Pebbles helped me talk about and read from Fenway and Hattie. I'm extremely thankful to Henry Bear's awesome staff who welcomed us so warmly and even provided games for the kids! And second, it was a dream come true when I was a guest author at the place where I discovered reading as a kid, the Duxbury Free Library. I had a great time sharing how I got inside a dog's mind, as well as reading and signing books to family and longtime friends. 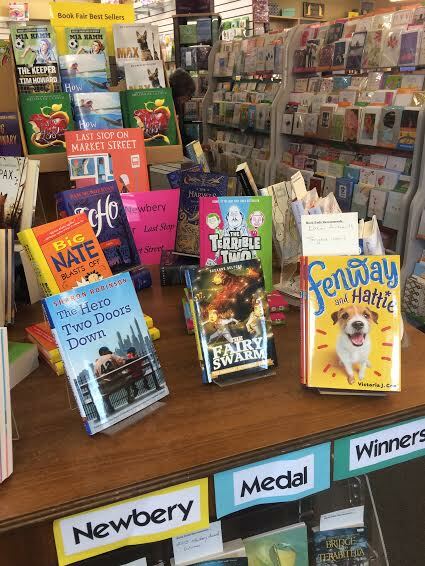 Huge thanks to everyone, especially children's librarian Nancy Denman who is a total, total pro! Her hard work really made this event a big success. I am beyond fortunate to be part of an amazing group of 2016 debut authors called The Sweet Sixteens. Aside from sharing the journey to publication together and forming incredible friendships, we each sent an advance reader copy (ARC) of our books "out on tour." Now that Fenway and Hattie is widely available in book stores and libraries, it was time to welcome my ARC back home. What a thrill to see it beat up (well loved!) and check out all the notes and doodles from these talented friends. Whew! It's been an incredible month! With the official launch behind me, I'm looking forward to connecting more with readers and visiting schools. Look for information coming soon!